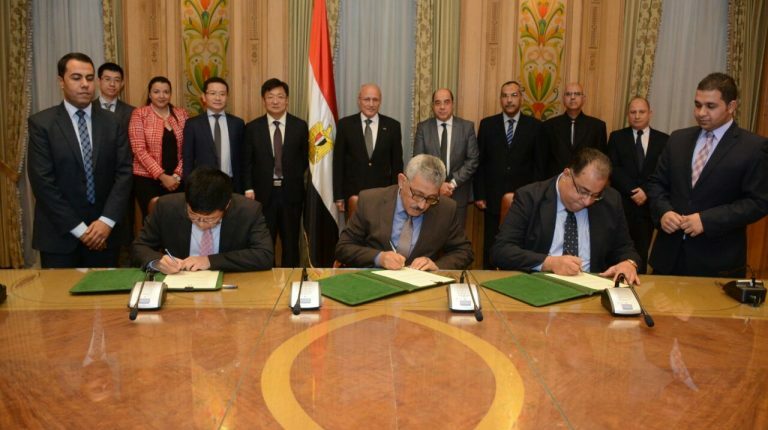 Minister of Military Production Mohamed Al-Assar signed a cooperation protocol between El Maasara Company for Engineering Industries and with both the global electronics company Huawei and Shenzhen Clou, with the aim of cooperating on manufacturing smart electricity metres for the Egyptian Electricity Holding Company (EEHC). Al-Assar met with the vice chairperson of Huawei and a representative of Shenzhen Clou, where the former stressed the importance of manufacturing smart metres in El Maasara Company. He also expressed his confidence in the advanced technologies of Chinese companies, stressing that he is looking forward to more cooperation with the two Chinese companies in several joint manufacturing fields of electronic devices. He added that, under this protocol, El Maasara and Shenzhen Clou will cooperate to manufacture the metres through passing on research and manufacturing expertise as well as preparing test labs and providing the necessary supplementary equipment in order to begin the project’s implementation. For his part, the vice chairperson of Huawei said that choosing El Maasara is a guarantee that military production companies have all the necessary technology and research capabilities to implement major projects. He noted that Huawei will provide all the necessary financing and marketing of the smart metres to be produced by El Maasara, according to the signed protocol. The representative of Shenzhen Clou expressed his excitement about starting the implementation of a smart-metre production line and providing all necessary materials and production requirements for El Maasara. He stressed that a training centre and an integrated lab to test the smart metres will be established for the project.